In Japan there are beverage vending machines every 100 meters. If you are out exercising you don’t have to carry water with you unless you want to. Just take enough 100 yen coins with you to stop for water at a vending machine along the way. Many machines have both hot and cold drinks. I don’t drink coffee, but I cannot imagine coffee in a can from a machine would actually be worth drinking. People do drink it, though. One of my newly discovered hot beverages is the hot lemonade sweetened with honey. Most of the vending machines I see are for drinks or cigarettes. 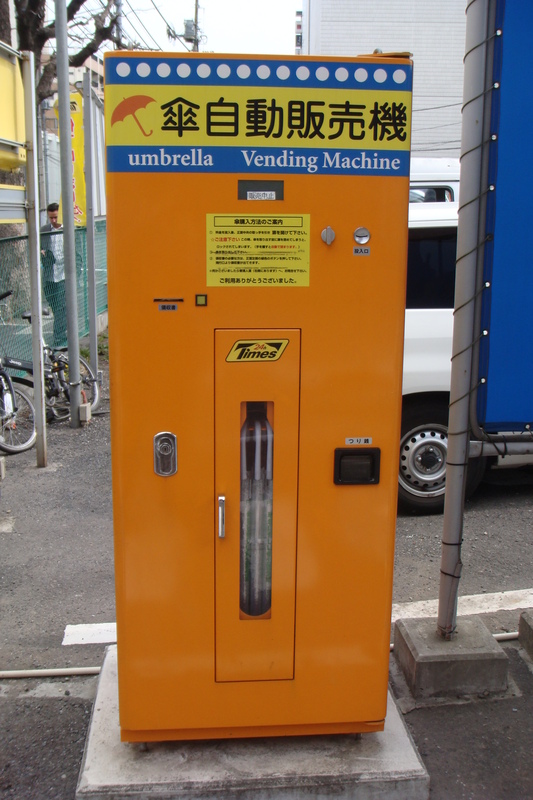 However, this handy umbrella vending machine is located in a parking lot not to far from my home. Due to my lack of preparedness and the frequent cloud bursts we experience in Tokyo I have no less than 15 umbrellas gracing my entry way. Fifteen umbrellas is a bit excessive for two people. You must understand that not owning a car puts me out in the elements more often. When I don’t have an umbrella and my option is being soaked I buy a new one. You can find them everywhere on a rainy day even in a vending machine. I love the new frequency of posts and all the pictures. Keep it up!